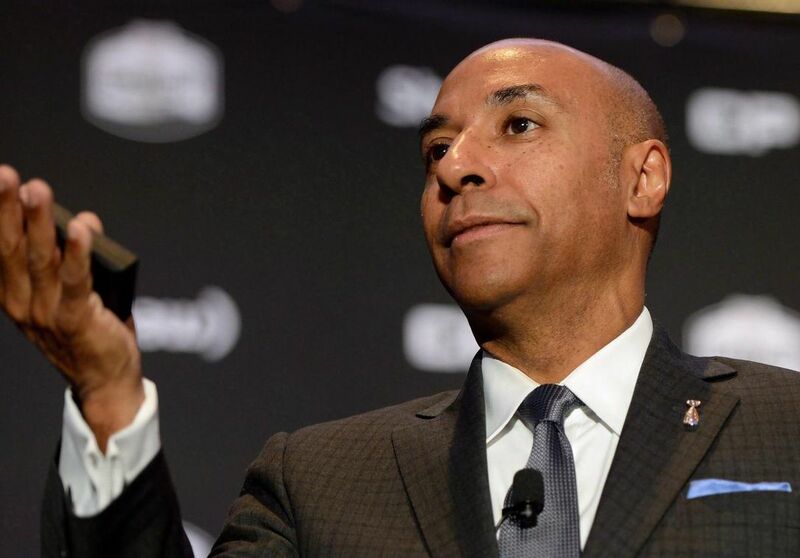 Former CFL commissioner Jeffrey Orridge has been named chairman of Tiidal Gaming, a Canadian eSports outfit. Tiidal is the parent company of Lazarus eSports, which was founded as SetToDestroyX — Canada’s first eSports group dating back to 2010. “I look forward to bringing my playbook to help Tiidal Gaming become a global leader in this burgeoning industry,” Orridge said in a statement. Orridge’s resume also includes stints with the CBC, Canadian Tire, Mattel, Right to Play, Reebok, USA Basketball and Warner Brothers. “As the eSports industry continues to develop, being able to attract and retain top talent remains crucial to our success both in competitive gaming as well as at the corporate level,” Charlie Watson, CEO of Tiidal Gaming, said in a statement. Raptors have been reaping the benefits of having 2019-04-03 18:41:47Now they’ll have to see if players like Boucher and Miller can follow in the steps of Siakam and VanVleet. Gardiner’s return, Rosen’s play creating a crowd on 2019-04-03 18:16:47Leafs coach Mike Babcock is probably happy to have options. Brooke Henderson looks to tee up history at 2019-04-03 17:21:45A victory by the Smiths Falls golfer at ANA Inspiration – an event Sandra Post won twice — would tie them for Canadian LPGA wins. Canadiens notch important wins but still battling for 2019-04-03 14:31:58The Canadiens have not given up, and down the home stretch they continue to surprise against the best teams in the NHL. Japan’s Matsumura dumps Canada’s Koe at world men’s 2019-04-03 13:16:40Japan scored five points in the third end of a 9-3 victory at the Enmax Centre. DAZN signs three-year deal for English Premier League 2019-04-03 12:16:38Beginning in August, DAZN will show all 380 matches during the EPL season as well as highlights, preview and weekly magazine programs. Former CFL commissioner Jeffrey Orridge named chairman of 2019-04-03 10:55:47Orridge will steward Tiidal Gaming, a Canadian eSports outfit. (Live at 9:00 am ET) 2019 Randox Grand 2019-04-04 09:00:00Watch day 1 of this iconic event from the famous Aintree Racecourse. Legendary Esposito brothers take one last shift in 2019-04-03 21:47:00Blackhawks legends Phil and Terry Esposito suited up for one final shift in the Windy City prior to Chicago's game against St. Louis. NHL's divisional playoff format to remain through next 2019-04-03 18:01:21The NHL and NHL Players Association on Wednesday agreed to extend the current configuration through the 2019-20 season, according to a report. Le Canadien refuse de baisser les bras 2019-04-03 11:37:00À mi-chemin de ce qui devait être son chemin de croix, le Canadien est encore bien loin du mont du Calvaire. Les Indians prolongent l'entente de Terry Francona 2019-04-03 10:36:00Les Indians de Cleveland ont conclu une prolongation de contrat de deux saisons avec leur gérant Terry Francona. L'Alliance of American Football suspend ses opérations 2019-04-02 15:21:00L'Alliance of American Football va suspendre ses activités après huit semaines d'activités seulement. U.S. women’s hockey league announces plan to expand 2019-04-02 15:32:24The board decision comes two days after the Canadian National Women's Hockey League's ceased operations. Raptors’ Leonard pays tribute to Hussle 2019-04-02 08:59:38Kawhi Leonard paid tribute to the late rapper Nipsey Hussle on Monday. Hess unhittable as Orioles beat Blue Jays 2019-04-01 23:19:11After 24 scoreless innings by their starters, the Blue Jays ran out of arms and ammo Monday. Nouveau look, vieux style 2019-04-04 01:01:41Eleider Alvarez est de retour à l’entraînement en vue de son combat du 28 juin. Maradona sous le coup d’une sanction pour avoir 2019-04-04 00:46:44La légende du football argentin Diego Maradona va faire l’objet d’une enquête pour infraction au code éthique. Brady Tkachuk étourdit les Rangers 2019-04-03 23:23:23Brady Tkachuk a poursuivi son excellente première saison dans la Ligue nationale de hockey (LNH).